Well this is a lovely mdf kit - see photo below from the empiresatwarblog - from "Empires at war" and designed for 28mm figures. It is not expensive (nor cheap) but looks great and seems great value for the £35 asking price (I am not sure about P&P). 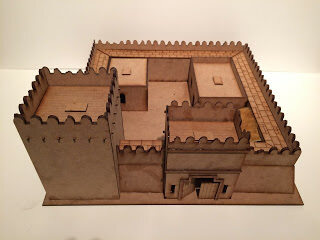 Photo above taken from blog shows the basic mdf kit assembled. It includes some internal buildings that can be moved individually, so removed completely or placed on different internal fort walls. These buildings have removable roof but I am not sure if this includes the tower and gatehouse but I guess it could be assembled to enable this. It will require assembly and painting (or as at their blog, texturising: with likes of sand / pva (wood) glue; or masonary paint, (unsure if smooth or rough best masonary paint?) or with wash of plaster "filler" which might do it? Their blog gives dimensions of 38cm x 36cm x 16cm for fort but I am not sure if this is Height x Width x Breadth / depth? It comes with assembly instructions but as I have only seen the ads I cannot say how clear these instructions are. This model may have potential for other scales too.